Studer “S30” Type RHU650-125C 10” x 31” Automatic Cylindrical Grinder s/n 441.55 w/ Studer Controls, Movomatic In-Process Gaging System and Sizing Controls, Motorized Work Head, Tailstock, Tailstock Fine Taper Adjustment, 18” x 4” Wheel Cap., Coolant. Tschudin Type HTG400 7” x 16” ( 12” x 16” with Risers) Automatic Cylindrical Grinder s/n 71958 w/ Tschudin Controls, Table Risers, Movomatic In-Process Gaging System and Sizing Controls, Compound Motorized Work Heed, Tailstock, 14” Wheel Cap., Coolant. Tschudin Type HTG400 7” x 16” Automatic Cylindrical Grinder s/n 78222 w/ Tschudin Controls, Table Risers, Movomatic In-Process Gaging System and Sizing Controls, Compound Motorized Work Heed, Tailstock, 14” Wheel Cap., Coolant. Reid mdl. 618HA 6” x 18” Surface Grinder s/n 14554 w/ Magnetic Chuck. Conrac “Grind-r-lap” mdl. M350 Tool Lapper s/n 84568-413. Lagun FT-1 Vertical Mill w/ Mitutoyo DRO, 1.5Hp Motor, 55-2940 RPM, 8-Speeds, Power Feed, 9” x 42” Table.Vertical Mill s/n 85998 w/ 3Hp Motor, 80-2720 RPM, 8-Speeds, R8 Spindle, 10” x 48” Table. Victor mdl. 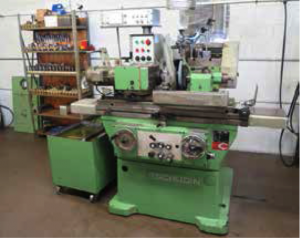 1630 16” x 30” Geared Head Gap Bed Lathe s/n 451048 w/ 65-1800 RPM, Inch/mm Threading, Tailstock, Steady Rest, KDK Tool Post, 5C Collet Closer, 10” 3-Jaw Chuck, Coolant. Hardinge mdl. HSL Speed Lathe s/n HSL-5C-4538-T w/ 3-Speeds, 5C Collet Closer. Noblewest No. 50 Roll Stamping Press. Thermo Scientific HERATherm OMH180-S 330 Degree C Stress Relieving Oven s/n 41214928 w/ Computer, Stress Relieving and Recording Software. Smog-Hog mdl. SG-4S-H Industrial Air Cleaner s/n 526258-0190. 2005 Chicago Pneumatic QRS10 10Hp Rotary Screw Air Compressor s/n CAI162476. American Tools 12-Speed Pedestal Drill Press. Famco No. 3 ½ R Arbor Press w/ Stand. Kendal Ultrasonic Cleaning Tank w/ Digital Controls. Scherr Tumico mdl. 20-3700 14” Optical Comparator s/n Y042401 w/ Quadra-Chek Programmable DRO,Shadow Detector, 10X and 20X Lenses, Surface and Profile Illumination, Stand. MicroVu mdl. M14 14” Floor Model Optical Comparator s/n 3162 w/ Surface and Profile Illumination. Ima Sikonki Diamond Core Hardness Tester w/ Accessory Kit. GEO Scherr Tool Makers Microscope. (2) Sunnen PG-800- E Precision Bore Gages. Sunnen PG-700- E Precision Small Bore Gage w/ Acces. Sunnen PG-500- S and PG-400- S Setting Fixtures. Federal Dimensionair 8000:1 Precision Air Bore Gage and Acces. Mitutoyo 18” Digital Height Gage. 2008 Okuma “Captain-L370M” 4-Axis Live Turret CNC Turning Center s/n 3722090103-525428 w/Okuma OSP-P200L Controls, Tool Presetter, 12-Station Live Turret, (12) Live Tooling Positions, (4) Radial and Axial Live Tooling, 4200 Spindle RPM, 6000 Live Tool RPM, 2” Thru Spindle Bore, Hydraulic Tailstock, Parts Catcher, 8” 3-Jaw Power Chuck, 5C Collet Nose, Hennig Chip Conveyor, Coolant. Okuma “Captain-L370” Big Bore CNC Turning Center s/n 108527 w/ Okuma OSP-E100L Controls, 2 ¾” Thru Spindle Bore, Tool Presetter, 12-Station Turret, 3800 RPM, Hydraulic Tailstock, Parts Catcher, 10” 3-Jaw Power Chuck, Hennig Chip Conveyor, Coolant. Okuma “Cadet” mdl. LNC8 CNC Turning Center s/n E136 w/ Okuma OSP-U100L Controls, 12-Station Turret, 1 7/8” Thru Spindle Bore, 4200 RPM, Hydraulic Tailstock, 8” 3-Jaw Power Chuck, Coolant. Closer, 4 ½” x 14” Table, Coolant (NEEDS REPAIRS). 13” x 25” Cap., Hand Wheel, Heidenhain Glass Scales, Tailstock Fine Taper Adjustment, Movomatic Probe, Length P ositioning, Dittle “Sensitron 2” Sizing Controls, 20” Wheel Cap., Coolant and Filtration System.